Republican Gov. Rick Snyder and Democratic challenger Mark Schauer differ sharply on issues such as the future of the Education Achievement Authority, charter schools and improving teacher quality. Republican Gov. Rick Snyder and Democratic challenger Mark Schauer agree on two things: Education is a priority and the success of schools is vital to Michigan’s future. But they would take different paths toward addressing the mountain of financial and academic issues facing public education in the state. Snyder, who frequently frames his view on education by looking at it from prenatal through careers, said his priorities include setting aside resources for prenatal care in distressed areas, continuing the state’s investment in early childhood education, ensuring kids can read by third grade, boosting career and technical education programs and providing greater opportunities for high school students to take college classes. Schauer’s priorities include overhauling the system for funding public schools and investing more in schools, ensuring every child has an opportunity to attend a preschool program, completing a study to determine the true cost of educating students, and using the results to ensure private companies that run charter schools aren’t profiting. The two candidates differ sharply on issues such as the future of the Education Achievement Authority, a reform district for the worst-performing schools in the state, charter schools and improving teacher quality. The next four years will be crucial for whomever Michigan voters elect: More districts are falling into financial disarray, academic achievement has been lackluster and schools are dealing with more rigorous standards and the challenge that they prepare students for life after high school. “People are talking about making Michigan a better place to live. That means good education,” said Amber Arellano, executive director of the Education Trust-Midwest, a Royal Oak-based education research and advocacy group. Her organization wants the priorities over the next four years to be about improving teacher quality, sticking with rigorous standards that spell out what students need to know to be prepared for college and careers, and ensuring charter schools that open will offer a quality education. No greater issue, though, divides the two candidates than Snyder’s record on school funding. Snyder often boasts that he increased funding for K-12 schools each year he’s been in office, and by $660 per student in the last three years. 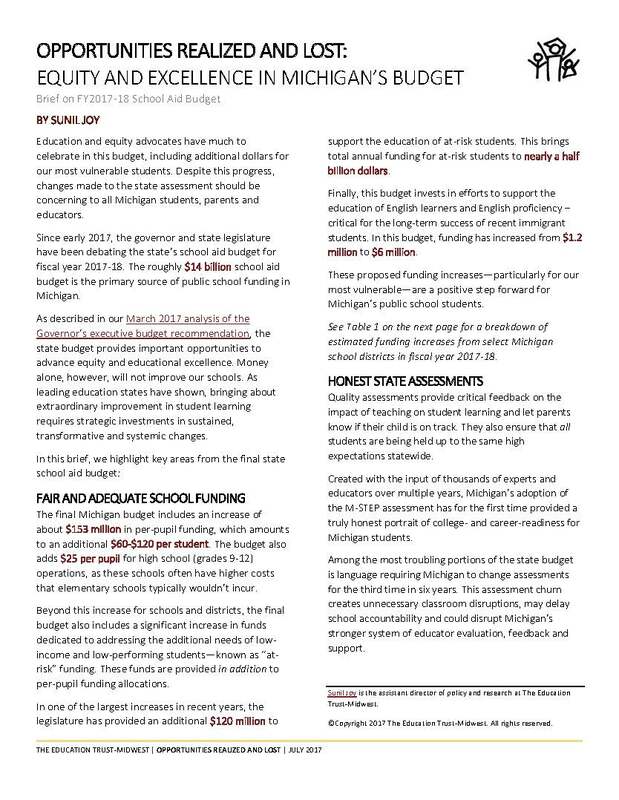 But Schauer and Democrats have pushed the contention that Snyder cut $1 billion from education — claims many, including the Free Press, have questioned. “The biggest piece of hogwash on the TV is the lie about the education cuts,” Snyder said in an interview Wednesday. The reality: The minimum per-pupil grant schools receive did decline sharply in Snyder’s first year in office, though that was largely because of the expiration of federal stimulus money that had helped boost funding for schools in the previous three years. Snyder increased funding in each year, though much of that increase went toward the state’s retirement system for public school employees. Many school administrators say they have less money for the classroom, resulting in burgeoning class sizes and program cuts. Enrollment declines haven’t helped. And K-12 advocates have expressed displeasure that money from the state School Aid Fund, which historically has only funded K-12 schools, is now being used to fund higher education. Randy Speck, superintendent of Madison (Heights) District Schools, wants to move beyond the debate and on to discussing “how school districts are funded and the inequality that school funding provides.” His district receives $7,126 per pupil, the lowest amount a district can get. “There are minimally funded school districts, such as Madison, that suffer year after year from trying to meet the needs of students, but doing so when our neighboring, competitive school districts are funded $1,000, $1,500 or even $3,000 more than us,” Speck said. Michigan districts receive an amount that generally ranges from $7,126 to $8,099 per pupil in state funding. A few dozen wealthier districts receive more because their taxpayers approved it. Arellano said states that have seen improved academic achievement made investments in school funding. Earlier in his administration, he tapped Lansing attorney Richard McLellan to lead a rewrite of the state’s school funding law. The result, through, was a controversial legislative proposal — that later died — that would have opened the door for anyone to open a public school.